One of my goals for 2014 was to try an Amazon affiliate program based E-Commerce website. The idea of an automated business that generates passive income is very attractive. I thought, shoot I know a niche market that would love an E-Commerce site, I have the tools to create a site, and I know a little bit about SEO, this shouldn’t be too difficult. I read a few blogs, read a few reviews, found a WordPress theme, found an awesome domain name, bought an Amazon plugin, made up an online store, created some awesome blog posts and……….did NOT sell a single item. FAIL. What the heck, I started digging into the data and what did I find? A big mess of code, confusion, and very little value given to my end user. I had full intentions of creating an awesome E-Commerce site like this. I debated whether or not I wanted to show the actual site and the actual numbers from it because I want to give it another go. But I think it is important to help others learn and hey maybe someone reading this can teach me some more. So I am going to throw caution to the wind and show you how I failed at starting an E-Commerce site. First things first, what did I want to sell? I wanted to find something to sell that is on Amazon and doesn’t have a highly competitive market. Trick is I needed to find a niche because people will search Amazon with or without my site, so I needed to give more value then just an Amazon product (more on that later). I love tinkering with my Raspberry Pi. There are plenty of big name vendors selling the Pi’s and their accessories. 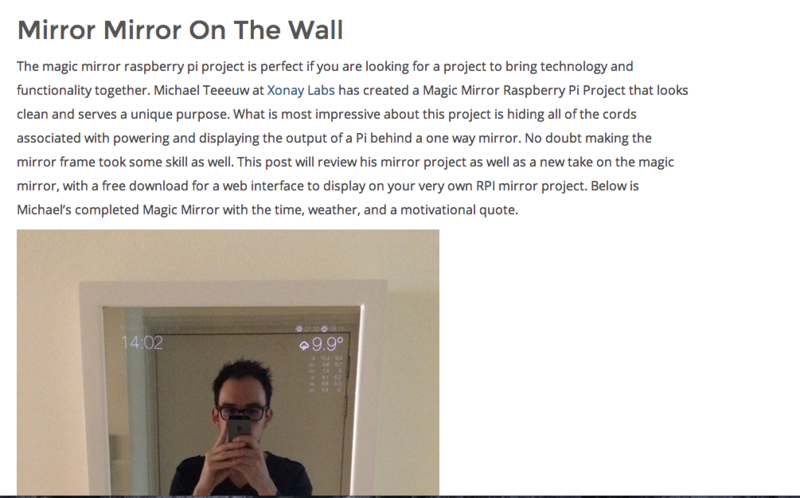 Alternatively there are plenty of blogs like lifehacker, hackaday, and many other individual websites showcasing awesome Pi projects and tutorials. But there are few websites that give awesome tutorials and projects and the exact parts needed to complete the project. Enter my idea. I did some domain research and found RaspiBakery.com was available. I snatched that up and I was off and running. Here is the blog page where awesome tutorials were going to reside. Fun little side note the permalink for this page is /projects-2….ya, more about that later. So where did it all go wrong? We will get into that, right now. I usually use WordPress for my websites, although I have hand coded some, used Drupal, Kirby, Ghost, Jekyll , and a few other CMS flavors to get a sense of what each can do. I knew about Woo-Commerce and they were a great resource for E-Commerce sites. So I started reading about their themes and plugins. I decided I would find a theme that played nice with their woo-commerce plugin. I decided to go this route because this plugin would give me the ability to create products in a shop, have product categories, product posts (with images, descriptions, related products, filtering by price options, etc) basically everything you need to create an e-commerce store. I decided on Virtue (E-Commerce or not I like this theme a lot) it makes so much sense where they put everything in the dashboard and it really is quiet flexible for a free theme. I highly recommend you give this a look. Their support is far better then most themes as well if you want to upgrade to premium. So once I had a theme picked out. I created a website and installed my usual list of plugins. Once I had the plugins it was time to start pulling in some Amazon products using prosociates. First, I needed an Amazon affiliate account for my E-Commerce site. I then needed to create an account. It is important to read their ToS (terms of service) and submit the correct paperwork. Singing up won’t work unless you either have an EIN for your company or are willing to give your SSN for tax purposes. After that I was given an Amazon tracking ID, this will be a unique link that helps Amazon track if someone buys something after visiting my site. A fun fact, if someone buys something on Amazon shortly after being on my site, even if it is an unrelated product I still get credit for the sale. Also, the more I sell the more I make. Amazon cuts checks once a month if it is over $100 (I believe). I wouldn’t know they cut me a bunch of $0 checks. So now that I had an Amazon account and tracking ID I needed to get a plugin to start pulling in products. I did some plugin research and found Prosociates. I took a gamble because Prosociates has some interesting reviews but I liked how the license allows you to use it for multiple sites. So I bought Prosociates, hooked up my Amazon account, created a cron job to keep prices up to date and boom I was able to put 350 products in my store, all in one day. So it appears Prosociates is ran by a handful of people so to be fair the support isn’t stellar and perhaps the results are overstated but hey I knew what I was getting myself into. After all if you are looking for a way to click a mouse 10 times and start making money, wake up, it will never happen. Here is a video about what Prosociates claims it can do. So after I bought the plugin I headed over to my site and upload/installed the plugin. Then I headed over to the Prosociate settings to configure the plugin. Click the link to register for an Associate ID key here. 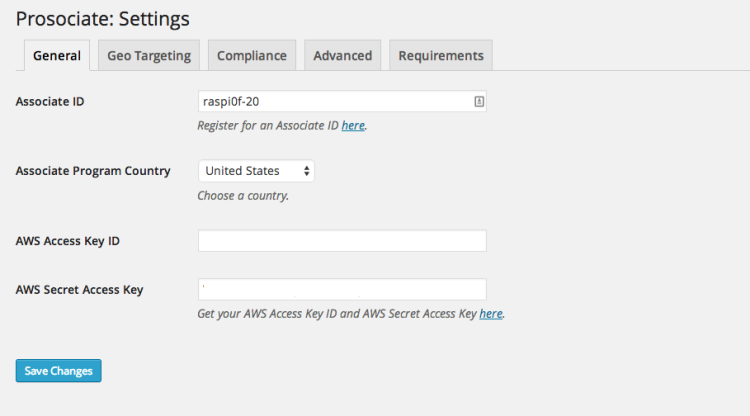 Connect Prosociates and Amazon Web Services using authenticated keys. If you are technical this will be a breeze. If you have no idea what that means, don’t worry it is relatively pain free. It seems like a lot of people had issues with this on Prosociates forum so maybe check there if this doesn’t work. Here is a how to video from Prosicates and it does a pretty job explaining what is going on. Here are some “optional settings” considerations that I wished I checked out before I posted my first products. In all fairness the YouTube videos from Prosociates does go through all of this but I was too excited to post products. Still they don’t explain what I am going to explain to you. So by default the posts are all created at one time, but I learned I can select “posts have randomized dates” between a range of dates. 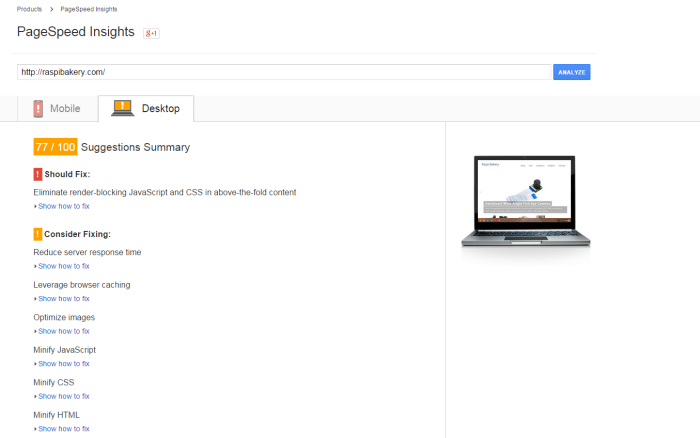 Pretty slick, and this makes my shop look more natural to end users but I am sure Google is smart enough to know what is going on. Also, (SECOND PRO-TIP: Unselect the auto-create product categories from Amazon browsenodes.) This was hell. It will basically gave my site every category known to man. It is a mess. Just don’t. The Prosociates video failed to mention that. The rest is up to you, pretty straightforward. 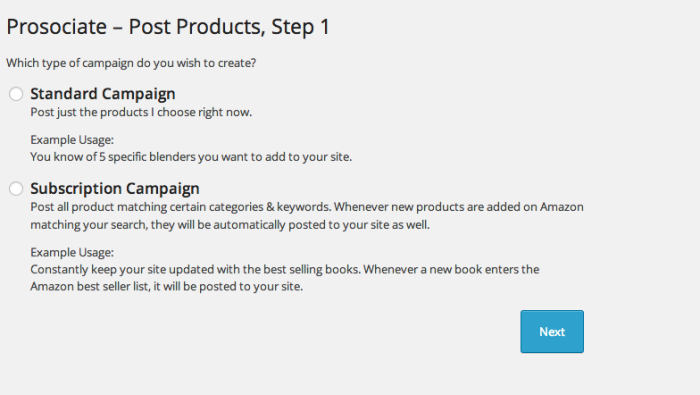 Now I clicked “Create Product Posts” and this took 3-5 minutes and imported all pictures, descriptions, product titles, and other meta data into my WooCommerce products section of my site. But of course I didn’t do one campaign and take my time to consider only certain products on my site. I just started mass inserting products. I had a huge mess of products, duplicate content, products that had nothing to do with my site (like an Amazon fire stick, nice one Amazon) and some horribly cropped images. Not only that but now I had a bunch of awesome descriptions, ratings, reviews, and a bunch of cool ways to sort products. But none of it was going to do me any good as it was duplicate content. 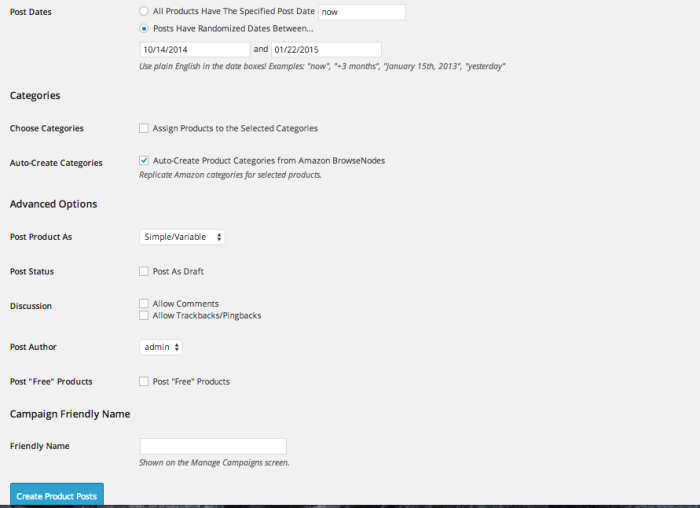 I went back to the settings of WooCommerce and Prosociates and learned about some features I had missed, like hard cropping, not importing Amazon categories, spreading out the post dates, and limiting the post title characters. The last one was huge, think about the amounts of variance there are in Amazon product titles, if you have a column based site that is going to be hell to style. This was a huge mess of products and not to mention duplicate photos in my media folder that I didn’t know which photos were link to which product permalink. I went to delete the products from my E-Commerce site and found my first SNAFU. 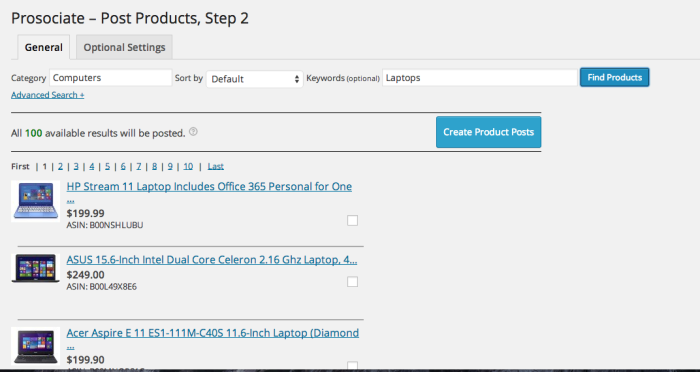 I could delete the product images but not their meta tag (category, tags, etc). So I found a way to dump the data using a SQL query and then uploaded products again, this time with more attention to deal. I must have missed something because now my site was bloated with huge amounts of images, and descriptions. Nearly every picture was in my media folder twice, and each permalink was burned so now I had a bunch of products with 404 errors. I took some database classes in college and got C’s so if this isn’t the best way, correct me but don’t sue me. I found this does work. WARNING: Always backup a site before performing sql queries (in case you mess up). So I went into my WordPress database and issued this sql query. So after failing to optimize products for my store, I did what any good entrepreneur would do and move on before fixing the issue, I fired up my MacBook and typed up 25 blog post ideas, and all of the awesome headlines I was going to use to drive traffic to my blog. I did research and found posts that had little competition and a few solid tutorials. I figured I can try the tutorial out real quick on my Pi, take some screen grabs, and rewrite the content to make it my own and then link to the store with some products that would help people complete the project. So I did. I ended up with 10-15 articles, all ranking on the 2nd-3rd page, a few backlink strategies worked and I ran a small Facebook Ad campaign during Black Friday. I was feeling good. I came back to my site after Thanksgiving and what do I see? Decent page views, decent traffic, some people put things into the cart, got redirected to Amazon and boom no sales. Great, just what I feared people get redirected to Amazon either get confused, feel duped, or don’t intend to buy and shopping cart abandonment sets in. I expected this, I know E-Commerce sites frequently deal with shopping card abandonment but I couldn’t believe one person didn’t buy. So back to the drawing board. I look at my blog posts and thought what value am I giving? The answer was, none, I mean these tutorials aren’t that in depth because I am copying another user’s tutorial. I don’t even know if this is the best way to install a media center on a Pi but I am going to write an article about it and pray I don’t get a technical question. I started buying my own Pi products, reviewing them and linking out to them. Well that got expensive, plus I don’t really need another Pi or more accessories. So I turned my attention back to the duplicate content issue and try one more time to make everything work. I login to my Google Webmaster account and see I have over 1000 404 errors. Makes sense after I deleted all that content, I know those will phase out after a while. I then check my site speed and it is horrible. So what have I given my users? I have a site with a bunch of broken links, duplicate content from the biggest shopping site in the World, and a website that delivers a piss poor user experience. This is where my journey ends for this moment in time. 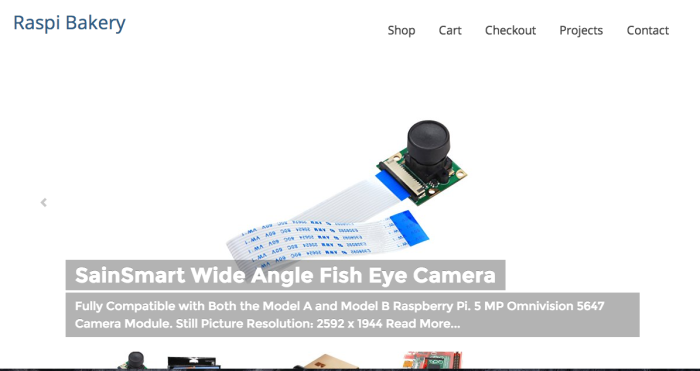 I am now rethinking my approach to starting an E-Commerce site and will take another look at the best way to deliver value to a niche market like the Raspberry Pi community. But for now I need to recharge my batteries and enjoy some NFL playoffs. Also my page speed could use some cleaning up. My first mistake was not reading documentation and getting too excited to create a site. Before I started I should have tried to better understand how Prosociates imported Amazon products. I should have learned how that looks with WooCommerce’s plugin. I then should have decided on hand selecting which products I wanted to import. So in short,find a handful of products that have good reviews, good pricing, and good shipping rates, make sure you spread product post dates out, DO NOT import Amazon categories, do not allow comments, make sure the hard crop parameters are acceptable for your site, limit Amazon product title length, if you must delete perhaps a 301 redirect is a better way to go. If you have the time and energy it would be better to rewrite each product description with more valuable information. Perhaps you can do some research on others who have bought that and how they are using them. For example if a laptop is able to have the RAM upgraded find a suggestion for RAM and talk about why a user would want to immediately update. In your Prosociates settings under advanced settings you can limited title length, make sure the Amazon page is redirect to a page before going to Amazon or go straight there, and enable the 90 minute cookie, like I was talking about earlier where you still get credit for the purchase after visiting Amazon through your site. I was really bothered by the amount of 404 errors I had on my site. I had no idea how permalink structures really worked because I have never deleted anything on my site and try to put back the exact same title. To redirect I would recommend just using a plugin. How are you going to handle all of the different picture sizes? This one is really tough. I did find a WordPress plugin that will regenerate thumbnails. This worked out beautifully to make all images the same size so they fit nicely in a column and row. If you have OCD about all of your images fitting just right, good luck. Content really is King. I would spend all my time on make a small shop with 5-10 products, each with custom descriptions, links, and credibility/trust boosters like secured with PayPal. I might even install an SSL on my site so users see the https request (although that is probably overkill). I would then spend all my time writing awesome blog posts and linking to stuff in my store when applicable and to other places on the net if it was cheaper or a better value. Got a question? Comment? Like this post? Help me share it.